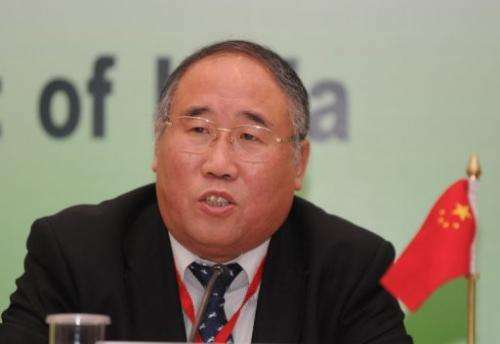 China's Vice Chairman for National Development and Reform Commission Xie Zhenhua addresses a press conference in New Delhi on February 14, 2011. Brazil, China, India and South Africa on Monday chided developed nations for not doing enough to curb greenhouse gases and fund efforts to confront climate change. In a joint statement issued after talks in the southern city of Foz de Iguacu, climate negotiators from the four countries making up the so-called BASIC group said developed nations' current commitments on emissions reductions and on financing were not enough. "Ministers reiterated their concern with the inadequacy of developed countries' current commitments on emissions reductions and provision of financial and technological support," the statement noted. Attending the gathering were Brazilian Environment Minister Izabella Teixeira, her South African counterpart Edna Molewa, China's climate high representative Xie Zhenhua and India's environment secretary V. Rajagopalan. Also present were delegates from Argentina, Fiji, current head of the G77 group of developing nations, Paraguay, Peru and Venezuela. Monday's statement came ahead of a UN conference on climate change scheduled for November in Warsaw. The Warsaw meeting will seek to make progress toward reaching an ambitious global accord by 2015 to reduce greenhouse gases. Brazil, China, India and South Africa pressed for commitments "by all countries" to curb gas emissions while taking into account historic responsibilities and capabilities, an issue which still divides emerging, developing and rich countries in the negotiations. This is rather laughable. These nations are doing far less, and China is the largest polluter in the world, bar none. I agree. I remember the Beijing Olympics, where they were hoping for rain to clear the smog. The people there walk around with face masks.